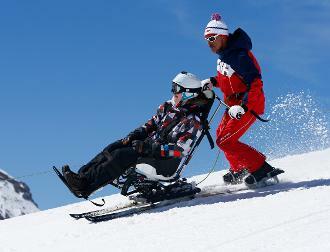 Anyone can enjoy the pleasure of skiing, that is why regarding any disability or needs, the ESF Porte Puy Morens offers adapted lessons with suitable equipment. You can either be on your own -if you have already practiced on your own- or be accompanied by one of our specialized instructor. In any case you will be able to experience a broader sense of freedom and enjoy the beautiful landscape of Porte Puy Morens. An unforgettable experience accessible to everyone! Please contact us for the dates & times.